Everybody seems to like dialogue. It can do a lot of things for a story, writingwise: advance the plot, deepen characterization, "show" rather than "tell," improve the pacing, etc. Besides, its just fun to read. I think it was Lawrence Block who said nothing engages a reader like listening to the people in a story talking things over. It's also fun to write. And it's easier to write, I think, than plain old description and exposition, because when my characters speak I can hear them in my head. The truth is, most of my short stories are heavy on dialogue. I've even begun a few of them with the intention of writing the whole thing in nothing but dialogue. One such story, "Careers," was published in AHMM years ago and another, "Doctor's Orders," at Amazon Shorts--the first was 1000 words in length, the second 6000--and I can still remember the fun I had writing those. It'll probably be no surprise to you when I say that many of my favorite genre writers--Harlan Coben, Joe Lansdale, Nelson DeMille, Stephen King, Lee Child, Greg Iles, Janet Evanovich, Steve Hamilton, Carl Hiaasen, Robert B. Parker, Jack Ritchie, Elmore Leonard, Donald Westlake--are/were absolute wizards in the use of dialogue. Some movies that are almost all-dialogue come to mind: Sleuth, Twelve Angry Men, The Hateful Eight, Proof, The Breakfast Club, and Glengarry Glen Ross, to name only a few. Several of these were originally plays, which makes sense.
. . . there are also some well-known stories that don't include much--or any--dialogue. Personally, I've only created a few (none of them well-known) that are seriously short on dialogue. One of my stories, "Bennigan's Key," a 5000-worder published a few years ago in The Strand Magazine, has no dialogue at all. But since it was prose, I was at least able to use unspoken thoughts (sometimes called "internal monologue"). The same could be said about Jack London's short story "To Build a Fire." In movies, the no-dialogue approach is harder to pull off. After all, a screenwriter can't tell you what the characters are thinking. He or she has only two ways to convey information to the audience: action and speech. And if no one's speaking . . . Even so, here are some excellent films that contain little or no dialogue: Life of Pi, Quest for Fire, The Bear, Cast Away, Gravity, All Is Lost, The Revenant, Apocalypto, Walkabout, and The Gods Must Be Crazy. 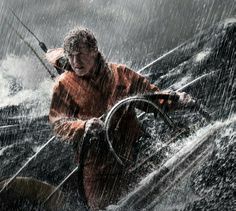 One of those--All is Lost, a 2013 film with Robert Redford as a lone seaman who battles the elements--contains only one spoken word: a common and graphic expletive, uttered after a frustrating setback. And despite the fact that nothing else is said during its almost-two-hour run, the movie manages to hold the attention of the audience throughout. An impressive feat. NOTE: It occurred to me only after jotting down those little-or-no-dialogue movies that all ten of them involve characters who spend the whole story walking around (or running around or floating around) in the Great Outdoors. I suppose a lot needs to be happening around them, to have any kind of interesting plotline. Can you think of other movies, or stories or novels, that tell the entire tale using no dialogue? If you're a writer, have you published anything written that way? How hard was that to do? Have you written any plays, or other kinds of fiction, that use almost nothing but dialogue? If you had to pick one of the two extremes--all or none--which would you prefer? "Let's hear it for a lot of talking," Dialogue Dude says. Quiet Dude makes no reply . . . Interesting post, John. When you first mentioned movies that are almost all dialogue, I thought, what else could movies have but dialogue. They have no narrator. Then I saw your list. I've only seen two movies on it, The Bear (back when it came out more than 25 years ago) and Cast Away, which has little dialogue once the plane crashes (until the rescue). I'll have to look for some of the others. But about Cast Away, even when Tom Hanks's character is marooned, he still ends up talking, to himself out loud and then to his friend Wilson the soccer ball. I guess it's human nature for people to talk, to find someone or something to interact with, even if the other side of the conversation is imaginary. Having the character do that probably helped the movie's writers too. One other movie that might fit your list is "Into the Wild." Once the main character entered the Alaskan wilderness, he had no one else to talk to. As to my own writing, my first mystery short story, "Murder at Sleuthfest," had no dialogue. It was all the main character telling a story. Even parts that could have been dialogue weren't. Instead the main character described the conversation, telling what she said. My second story, "Compulsive Bubba," has--if I remember correctly--less than a page of dialogue despite running about a dozen pages long. In those early stories I was still finding my way as a writer. I approached the tales as if the main character was sitting around a campfire, telling a story. Funnily, even though I'd write those stories differently today, they both were well received. Indeed I still hear from readers about how they loved "Compulsive Bubba." I guess it was the voice. Internal monologue can take the place of dialogue if it's done well. Anyway, interesting post, as always. John. Now I have some movies to go watch. Great post, John--and great reflections on stories/films that don't depend on dialogue. My favorite movie (one of them) is Vertigo, and I'm always impressed the most with the early scenes there that are entirely image-driven, how much tension and suspense are created in those scenes. Barb, I think I too wrote my first few stories with a lot less dialogue. Maybe I didn't yet know how much it could add to a story. But, as you point out, it all depends on the project. As for Into the Wild, that IS a good example of a movie that has very little dialogue--I have in my pile of DVDs and need to watch that again. Thanks, Janice! Yes, a narrator (a voice-over narrator, I guess, in the movies) is sort of a compromise. If I recall, that's what happens in most of The Gods Must Be Crazy, and its sequel too. The main thing is to keep the reader/viewer interested, right? Art, I agree, on Vertigo. If I remember right, we spent some time discussing that movie in several Criminal Brief columns, because so many of us liked it so much. The images, and the great score, were all that was needed in some of the best scenes. Matter of fact, there were a number of really long scenes in Psycho, and other Hitchcock movies, too, that had no need for dialogue. I always think of dialogue as hard to write WELL, but the good writers (I'd add Dennis Lehane, Chris Knopf, and S.J. Rozan to your list) make it LOOK easy. It's easy to read, though, and really does draw the reader into the story. When I taught, I always had several kids in "low ability" classes who could write brilliant dialogue. They couldn't read very well, but their listening skills verged on genius. I find that writing dialogue is how I get to know my characters more deeply. How would they say what they say, and why? Thanks for giving me something else to think about. Other films with little dialogue: Remember the sequence in Psycho while Tony Perkins cleans up the crime scene and dumps the car into the lake? I don't remember exactly how long it is, between eight and eleven minutes (?) with no speaking at all. I agree that dialogue can make the writer, as well as the reader, feel really close to a character. It's one of the advantages, I think, of a series, whether it's of novels or shorts: the writer gets so comfortable with a character that his or her dialogue becomes (or should become) easier and easier to create. And I always think of Parker's Spenser novels when I think (as Janice said) of first-person narrators. I just thought of another interesting film with almost NO dialogue: The Naked Prey. Cornel Wilde, running around in the wild. A good (and old) movie--50+ years ago. I come from the comedy writing world so I am a dialogue junkie. I simply hate stories or books that have more than two pages in a row with no dialogue on them. Don't TELL me the tale - SHOW me! btw, I used Twelve Angry Men in my college communication classes, plus my film classes. Brilliant film, brilliant script. I think most of my stories contain a healthy mix of dialog and narration, but it isn't by intent. I strive to create a good story well told. Sometimes the end result is dialog heavy and sometimes it's narration heavy, but if the approach fits the tale, I let it ride. "Well, John," Michael said, "I know you're a mystery writer from Mississippi and..."
Melodie, I think dialogue is one of the best ways in the world to show, not tell. 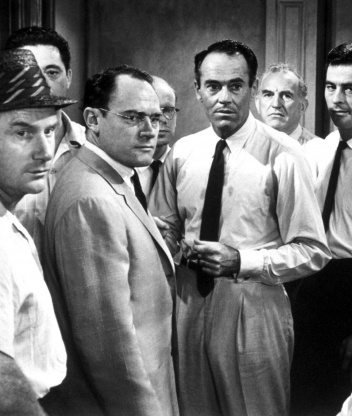 As for Twelve Angry Men, that ought to be required viewing for every writer. Who says you can't have high tension in a roomful of folks talking? The switchblade scene, and the look on Fonda's face, still gives me goosebumps. Michael, I think Robert McKee once described the old "revealing too much information through dialogue" approach as "table-dusting": the maid who's been with the family for years takes the newly-hired maid aside and, while they're dusting the furniture, tells her (and the audience) EVERYthing about the family and their background. It's all too easy to commit that error, as a writer. And yes, one exchange of bad dialogue, especially early in your story, can kill it. But I've heard editors say they'll stick with a story if there's really good dialogue, early on. John, my list of favorite authors includes all the ones you named. I depend on dialogue a lot because, as you say, it's easy to "read" a character from his or her words and attitude in speaking. It's also easier for me to write than full-blown descriptions. Another advantage is that it helps keep the pov clear. I've enjoyed many books written as letters but can't think of one that is 100% dialogue. Think I'll try a short story in all dialogue today. Fran, I know your stories and novels include a lot of talking, and I think it's easy to see that you enjoy that. The writing-in-ALL-dialogue approach is a little different, but I've found it to be a lot of fun, the few times I've tried it. One thing we've not mentioned a lot is "pacing." Dialogue, like short sentences and active voice, speeds up the pace of a narrative, and can be used along with passages of description and exposition to adjust and improve the "flow" of a story. Since I seem to prefer "faster" reads, I like a lot of dialogue. Great post, John. Like you, I usually use a lot of dialogue in stories. I think it's one of the best ways of developing and revealing characters. Sometimes, even a quick exchange can give readers a strong sense of a character's personality. Thanks, Bonnie. I not only like reading dialogue, I find myself missing it if a story I'm reading goes too long without any. As Michael said, the story itself determines whether it should be dialogue-heavy or not, but as a writer I try to include it often and as a reader I appreciate it when I see it in the work of others. I think it was Jimmy Stewart who said the best acting came through the actor's eyes. Stewart was an expert at conveying that. I think the writer and or director may have something to do with that. Hitchcock said turn off the volume and watch a movie and you should be able figure out what's going on. I agree with both of them, but I love dialogue and use a lot of it in my writing. The stories I've written are a mix--never have written all dialogue or all narrative/description. This brought to mind an old Twilight Zone episode, "The Invaders," in which Agnes Moorehead is under attack by aliens. No dialogue, and with the usual TZ twist at the end. Excellent post, John. I thought I had a few stories with little, if any dialogue, went through most of my published and found I was wrong. Only exceptions was a story from the point of view of a non-human. Deborah and O'Neil -- Thanks for chiming in, here. I've read enough stories written by the two of you (and your novels too, O'Neil) to know how much you two employ dialogue in your tales. And Deborah, I like the Jimmy Stewart observation, and Hitchcock's too. O'Neil, when you have time, please point me to that non-human POV story, or maybe send me a copy (?). Thought provoking post. I once wrote a story entirely in dialogue with not a word of narrative. It was published in bj's old emag Mouth Full of Bullets. Fun to write--and a challenge. I rely heavily on dialogue in most of my stories. Herschel, I think I remember that story of yours--but I agree that that's a challenge. Dialogue adds a lot to most stories. I still love the name of BJ's old magazine: Mouth Full of Bullets. I too had some stories in there. Way back when I first decided to write a 2,500 word short story, which ended up as 125,000 word novel, I thought of myself as a dialogue writer. I went to the local collage to take writing classes "to discover how to write a short story rather than a novel." I always hated reading or writing long passage of narrative so imagine my surprise when I took a screen writing class where I couldn't write narrative and had to write all dialogue. It drove me crazy (I wrote the worst one-act play ever), but made me realize I write a nice mix just a little heavy on dialogue. Pat, that probably is a good mix. And yes, the first time I had to write a screenplay, I found out fast how different that is. Given the choice, though, I enjoy writing dialogue far more than writing anything else. I think it's usually a good thing when a short-story idea turns into a novel. BUT . . . I've also read several novels that I think would've worked better as short stories. You know what I mean. Thanks for taking the time to stop in, here!